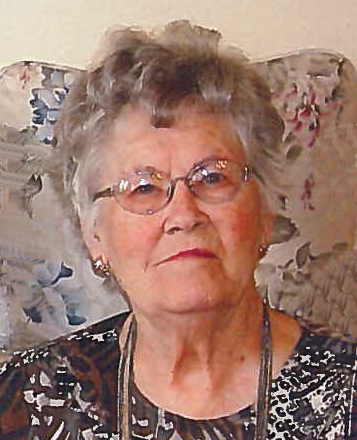 Harriett Evelyn (Stek) Brand went to be with her Heavenly Father on October 10, 2018 at the age of ninety six. Harriet was born on July 30, 1922 to William and Gertie (Heslinga) Stek on a farm southeast of Lacey, Iowa. She attended Johnson No.5 country school, about 1.75 miles from her home. It was there that a teacher added a second “t” to the end of her name to distinguish her from another student with the same name. Her name became Harriett from then on. After graduating from Oskaloosa High School in 1941, she received nurse’s training at the Mercy Hospital in Oskaloosa and began her career there. Harriett met her husband, Raymond Brand, when he became a patient at the hospital. He recovered quickly, asked her for a date and they were married on April 18, 1945. After marriage they farmed on Raymond’s family farm near Sully before purchasing a hilly, 120-acre farm southwest of Lacey. Through hard work, perseverance and the grace of God, they established a successful dairy farm and lived there until they retired. In 1982 Raymond and Harriett sold their farm and moved to a house in Pella. In retirement, they found joy in woodworking, travelling, and volunteering. Three years after Raymond’s death in 2012, Harriett moved to Vriendschap Village and then to The Cottages. Like the woman of Proverbs 31, Harriett was a caring, hardworking and generous mother whose hands were rarely idle. She enjoyed the beauty of creation, and turned many natural things into works of art. She freely gave away garden produce and beautiful knitted and crocheted items to family, friends and charitable causes. Her faith and perseverance were shaped in part by the birth of her youngest brother Gordon who was severely disabled with cerebral palsy. As a child, she carried him on her hip until he became too heavy to be carried. Despite the difficulties of meeting his needs, she and her family testified that God had sent Gordon into their lives to strengthen them and to teach them many valuable lessons. For the rest of her life, Harriett had a special empathy for those who are disabled. Harriett is survived by her children, Joyce (Marvin) Van Haaften, Carolyn (Alvin) Ver Meer, Ivan (Ruth) Brand, Gordon (Beth) Brand, Mary (Darrel) Kraayenbrink, 21 Grandchildren, 35 Great-grandchildren, 4 Great-great-grandchildren and her sister and brother-in-law, Clarissa and Gerald Rozenboom. Preceding her in death were: her parents; husband Raymond; brother John H. Stek and wife Nadine; brother Gordon Stek; sister Kathryn Van Gilst and husband Edward; Raymond’s Family Irene (Brand) and Ernest Graham; Vera (Brand) and William Vos and Carroll and Patricia Brand.